I'm sure I liked it at the time and am almost equally sure I'd find it laughable trash -- or worse yet, dull trash -- now. The poster, though, has a curiously 1950s look, which holds out some kind of promise for the better class of trash. Ouch. I noticed he'd done that and forgot to fix it. It really is ugly, isn't it? My brethren and sistren, I am rightly (and properly) chastened. Link fixed in my original post (though by this point, that may be of import to none but BlitzGirl, however long it may take her to arrive there) and in the quotation above; can't do much about other quotations. jjjdavidson wrote: I've seen it, and actually, it's not a bad Saturday-matinee monster flick. And (if I may be forgiven for allowing the Outside to intrude) it's on Turner Classic Movies tomorrow (Friday 04/12) at 06:15pm Eastern. He's right about the movie poster (being a good boy and not hotlinking it). No, and I think all the parentheses were properly closed off. Anyway, it sounds like a throwback, and not for the poster alone. Are there any obvious (or even subtle) references to old Saturday-matinee monster flicks? I don't get TCM, but perhaps it's on Netflicks. I bet Megan is lying on her back, legs locked around something (or not), and feet sticking up, with head and shoulders leaning back off the plank Planck, and hands behind her head, casual-like. Meanwhile Cueball is gaping at her, somewhere between nonplussed and aghast at this daredevilry. Last edited by partingLance on Fri Apr 12, 2013 5:35 am UTC, edited 3 times in total. Wha—is that a chicken up there? No, no, it's just the way she's holding the grapefruit. Not bungee jumping, just tieing the rope down up side down. If you insist. That'll be $100 for misdemeanor defacing of a comic. I have decided my Knightly name. Henceforth, I shall be known as Sir Tristram*, the Simple, Defender of The One True Comic. Any quests to prove myself with? *Not to be confused with the knight who was part of what the outsiders call "The Knights of the Round Table." Mikeski wrote: If you insist. That'll be $100 for misdemeanor defacing of a comic. I thought it was only $20 and your self respect. The sea is going to come in and destroy their castles made of sand, but by that time they will have built an... I'm not sure what you call an oil rig when it's not used for oil drilling purposes. A rig? A sea platform? And then they can build that into a real castle. ...hauling more lumber in by boat if necessary. Pfhorrest wrote: The sea is going to come in and destroy their castles made of sand, but by that time they will have built an... I'm not sure what you call an oil rig when it's not used for oil drilling purposes. A rig? A sea platform? And then they can build that into a real castle. Added: But seriously, I'd be more inclined to go with "sea platform". I think derrick is specifically the towering part specifically for drilling, especially since oil derricks can also be in land drilling. Seems to fit the wikipedia definition of a derrick pretty well. A tower with lifting mechanism. Close enough, anyway. Platform also works. Here are a couple of quick templates for how we could do pages for The Bible. Would probably need to decide what the name of this 'Book' is before we go away and create many more pages. Suggestions welcome. Also people wanting to add content are welcome as well. Is there going to be one page in The Bible per page on the forum? EDIT: Sorry for double posting. OnTopix [new word coined, please use]: The Megan wiggly ladder incident is actually her handing Cueball the first long stick thingy. When you pass something above your head it is usually a bit unwieldy, not because it's heavy, just...because. 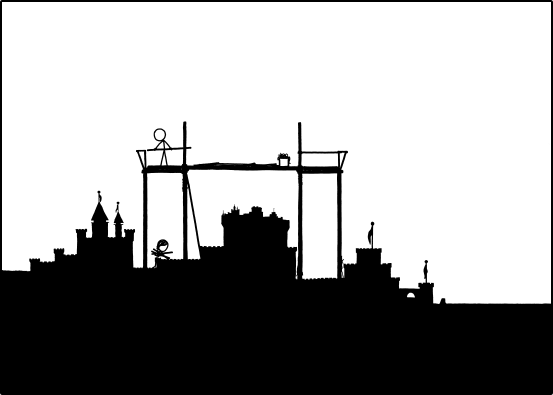 There is an error because of this motion: The ladder is actually missing, then back again in the next frame when it's being used. Is the OTC imperfect? The bible should be called The Babel. Exodies wrote: Are we going to have a vote on whether there will have been Knights Temporal? It has already been had....in the future. fhorn wrote: I've lost track of whom to beseech/implore/bribe, but could whomsoever hath the power to deem it so please deem me Knighty Knight? Then I may coma at will. Coma is a sickness. You should not want to succumb. Coma is like original sin, we're all inflicted by it but must one day find freedom from it. Must do. My evil streak sayeth that Randall must be spammed in return as he hath spammeth useth. Special arrangement with FedEx or a local vagrant. Twenty bucks and free booze will work for either. The first frame should most likely be time.png, but it's the default for everyone until the script kicks in and replaces it with the current frame. It confusedly is right there, we are just expecting more strange hashed file names instead. Time teaches us to be aware of what is there in the present, not the past, and not the future. She is totally just hanging upside down getting her bearings, and Cueball is like, "Oh me yarm, what is my girlfriend doing??? Should I be concerned? Should I leap to her rescue? should I ...."
Also it suddenly occurred to me: what if BHG happened upon the construction project? What might he do, or not do? [EDit] I hereby dub this thread page 303 "See Other". Latent22 wrote: Would probably need to decide what the name of this 'Book' is before we go away and create many more pages. Clearly, the only viable alternative for the name of this 'Book' is The Bibel. It avoids confusion with that other tome and has a nice ring to it, being one letter off from The Babel. And as an operational note, this timething finally drove me to register after 5 years of lurk. I was hoping to be the final member so I could slam the door behind me but alas, no door. And since this is my cherry-popping post, it'll show up sometimewaitedtime in the future, I think, so who knows what construction madness will be the rage. Not sure what that buzzing sound in my head is tho. The trapezoidal illusion has become stronger. The Babel of Time or just The Babel? In the Bible, a city (now thought to be Babylon) in Shinar where God confounded a presumptuous attempt to build a tower into heaven by confusing the language of its builders into many mutually incomprehensible languages. Is anyone else having trouble seeing the latest NewPix? My data stream is still giving me the hash of the frame from one and a half Outsider hours ago, even when I close it and open a new one. Using c0.xkcd.com, FWIW. Added: Not just me, after all. It's glitched the geekwagon.net site; it shows the current frame twice, with an empty frame in between. So far, aubronwood seems unaffected, though. Last edited by KarMann on Fri Apr 12, 2013 5:42 am UTC, edited 1 time in total. A proper God would have confounded blah blah by turning their cement into caffeinatedsemenbabycancer. Why be indirect? If it's about building, deal with building materials. If it's about communication, then ok deal with language. KarMann wrote: Is anyone else having trouble seeing the latest NewPix? My data stream is still giving me the hash of the frame from one and a half Outsider hours ago, even when I close it and open a new one. 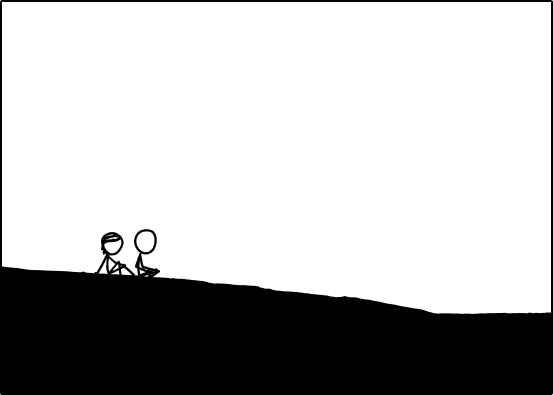 Using c0.xkcd.com, FWIW. Just use more normal means of getting your comic. Here you go: OTC. I haven't had any problem. I also use https://dl.dropboxusercontent.com/u/9818122/xkcd_time/ordered/###.png, but that works a minute after live. Whoever made that, thanks. I, uh, make you a Knight Temporal, please claim your position. Just use more normal means of getting your comic. Here you go: OTC. I haven't had any problem. I also use https://dl.dropboxusercontent.com/u/981 ... /ordered/###.png, but that works a minute after live. Whoever made that, thanks. I, uh, make you a Knight Temporal, please claim your position. Added: It looks like the connection is dropping once every 10 seconds, on the dot, so almost certainly server problems. Added2: I'm getting curl exit code 7, "Failed to connect to host." As an Outsider religious argument, it is quite a good one. The only issue is that "the Bible" deals strongly with the idea of words, the power of words, so a lot of the lessons are language based. Bible just means book, and a book is just a collection of words. "Let there be light" and the Ten Commandments, and whatever else is famous, are all just words. To destroy or change the very molecules of life would not send the right message, while it would be possible, it's just not His Thang. If the sea is rising... Are they building a boat? A kinda Noah's ark?? I had a couple of suggestions for names a few newpix ago, "The Past", "The Book of Time", "How to Build a Sandcastle". I'll also suggest in tribute to our valuable resource, "The Book of Aubron". Whatever is chosen, on the inside of the back cover should be a command, the command that Lord Randall would see every time he read the book and reached the newest OurPix. "Wait for it." Time to succumb to coma and wake up in the past. I may not be reliving the same day over and over again, but being stuck in the past feels just as daunting. SBN wrote: I guess I'm the lone voice in the wilderness. But then I'm still of the belief that Newpix and Timeframes are the same thing. * not that one. Keep googling. I don't think two-leafed clovers are quite as iconic.